Fishermen can be found in the park on almost any day of the year. The opportunity to catch bluefish, striped bass, weakfish, and other species from the surf has drawn anglers to Island Beach well before the park was established. Island Beach State Park provides a variety of fishing opportunities for people of all ages, physical abilities, and fishing skills. If you fish from the beach you will need to register with the New Jersey Saltwater Recreational Registry Program. This is not a license and no saltwater fishing license is needed for surf fishing. Fishermen are allowed to stay in the park after the main gate is closed but only people who are actively engaged in fishing can remain on the beach between midnight and 4 A.M. There is no fishing in the established swimming beach area from mid May through mid October. Check with park management for the exact dates of these restricitions. Fishermen are required to follow all applicable laws established by the New Jersey Fish and Wildlife Department. 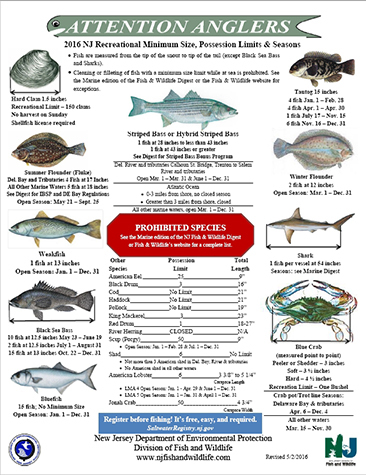 There are regulations concerning species specific catch restrictions and limits and if you fish, you need to know and follow these rules. Visit the NJDFW website for more information about fishing in New Jersey. The annual Governor's Surf Fishing Tournament is held in Island Beach State Park on the first Sunday in October. You can find out more about this event at the NJFWD website or at one of the many outdoor shops in the area. During late spring from April until Memorial Day, try fresh clams. Walk on access at Two Bit Road, Coast Guard Station #110, and all parking areas. Bluefish arrive in Barnegat Bay around May and remain until the middle of June. Park at A-15 and try small poppers and light tackle. Fly Rod Fishermen also enjoy catching blues on poppers. Watch for "bluefish blitzes" along the beach from Memorial Day to July. Swimming plugs and metals are good choices. Bait anglers have success with whole mullet on mullet rigs. In early summer, try plugging for striped bass at dawn and dusk. Retrieve slow for best results. Best bets; north jetty at south end of the park, and walk the beach south from Coast Guard Station #110 to Giliken's Road. Weakfish arrive in early May and remain until October. Try Fin-S, soft jigs, or sandworms on a 3/0 bait hook with a split shot. Best Bets; Barnegat Inlet, bay side shoreline from A-15 to A-21. Fall is by far the BEST TIME for surf fishing. Schools of mullet, menhaden, and other baitfish migrate along the beach and attract striped bass, bluefish, weakfish, drum, false albacore, and others close to shore. Surf anglers using surf poles and fly rods enjoy this fall fishing frenzy. Striped bass are more active at dusk and can be caught well into December.